We are in Chile with an SOA (School of the Americas) Watch solidarity delegation to mark the 40th anniversary of the overthrow of Salvador Allende’s Popular Unity government by a US-backed military coup. We have the sense of being suspended in time, like walking back into history and ahead into the future, at the same moment. It is an intensely emotional experience. Along with many of the 60,000 marchers, I’m carrying a photo of one of the regime’s victims. In my case, it’s Omar Enrique Astudillo, age 20, from a small farming community outside of Santiago, who was detained and disappeared by the Carabineros (federal military police) on October 7, 1973. His remains turned up 5 years later in the oven of an abandoned limestone quarry at Lonquén, and were identified in 2010. Of the more than 3,000 people murdered by the dictatorship, 1,200 are desaparecidos who have yet to be found. The march ends at the general cemetery where participants mark the graves of Allende and others with floral tributes. To avoid the tear gas and water cannons that usually materialize at this point (and did even on this largely peaceful occasion), we make our cemetery visits a day earlier. We visit Patio 29, where the regime dumped anonymous bodies into existing tombs during the weeks after the coup and a massive marble wall Memorial to Persons Detained, Disappeared, or Killed for Political Reasons, which lists all the known victims of the dictatorship. At the gravesite of Orlando Letelier, a Chilean diplomat assassinated by the secret police in Washington DC in 1976 (and a relative of one of our delegation coordinators), we have a chance encounter with several other Allende cabinet ministers who had been detained and tortured with Orlando. Last year, after decades of relentless efforts by Jara’s widow, 8 former army officers were indicted for Victor’s murder—including Pedro Barrientos, now a US citizen living in Florida. To date, he has not been extradited. Jara’s widow has now filed a civil suit against him in Florida under the Alien Tort Statute and Torture Victim Protection Act, seeking damages for torture and extra-judicial killing. 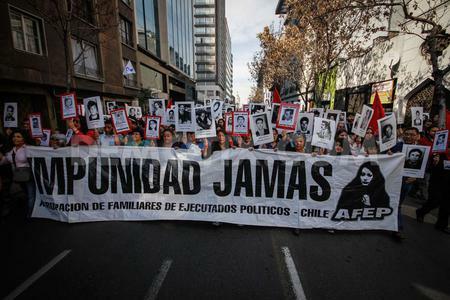 The demand for accountability and an end to impunity for the perpetrators of such atrocities, many of whom continue to play important roles in Chilean politics and business, is a key way in which Chilean human rights activists are seeking to mobilize the memories of the past in the service of a better future. According to Amnesty International, only 260 people have been convicted of Pinochet-era crimes, including 60 top military operatives who are serving lengthy jail sentences. More than 1,000 active criminal cases are grinding through the judicial system, thanks to the ceaseless efforts of victims’ families and courageous human rights lawyers and activists. We meet with activist legal advocates, who recently chained themselves inside a government office to demand action on hundreds of stalled complaints. They describe their current efforts to bring charges against retired air force General Fernando Matthei, a member of Pinochet’s ruling junta, for the murder of General Alberto Bachelet, an Allende loyalist who died under torture in a military school run by Matthei. Today, the daughters of the two generals (Evelyn and Michelle) are the respective candidates of the center-right and center-left party coalitions in the November presidential election. The families were once friends and neighbors. This telenovela (soap opera) undercurrent to the campaign has helped to keep the issues of impunity and accountability in the forefront of public consciousness. During the week, we visit several former detention centers that have been “recuperated” and transformed as sites of memory. Under the dictatorship, political prisoners were held and tortured at more than 1,100 clandestine sites, including government buildings, stadiums, offices, ships, and expropriated resorts and private homes. More than 250 detention and torture centers operated in Santiago alone. New sites are still being discovered. Casa Nido 20, former torture center. Credit: Ben Achtenberg The smaller sites like Casa Nido 20, tucked away on a quiet tree-lined street in a middle-class neighborhood, are in many ways the most devastating. In most cases, they have been recovered (and continue to be maintained) by neighborhood human rights committees, though painstaking investigation and collection of survivor testimonies. A unique aspect of Chile’s traumatic history is that so many political prisoners who were tortured managed to survive, and even return home after exile. They now serve not only as living witnesses to the memory of horrific events but, in many cases, as leaders in civil society’s vibrant human rights movement. Unfortunately, the persecution of political dissidents in Chile is not entirely a thing of the past. At one memory center, we meet with Mapuche leaders who explain how Chile’s draconian anti-terrorism law, a legacy of the dictatorship era, has been used by successive democratic governments against indigenous activists accused of low-level crimes like land occupations or property destruction. The law, which allows suspects to be detained indefinitely and tried in military courts based on evidence from anonymous witnesses, has been broadly criticized by international human rights organizations. While US complicity in facilitating the 1973 coup is well-known, its continuing role in aiding the Chilean military also remains problematic. We join a demonstration at Fuerte Aguayo, Concón, near the port city of Valparaíso, where the US has invested $500,000 to construct a training base for “urban peacekeeping” soldiers. Opened in April 2012, the facility simulates an urban zone and is run by the US Southern Command. Chilean human rights groups fear that the facility is aimed at repressing civil unrest and social protest, especially among the Mapuche. Our demonstration also calls for Chile to withdraw from the SOA (now WHINSEC), following the lead of 6 other Latin American nations. Chile continues to send 140-200 troops annually for SOA/ WHINSEC military training, the second highest number of any country. Most of the dictatorship’s worst human rights abusers—including 4 of the 8 indicted for Victor Jara’s murder—were SOA graduates. The students we meet—representing the FECh (University of Chile Student Federation) and other sectors—offer a fundamental critique of the Chilean education system inherited from Pinochet, which is characterized by privatization, decentralized municipal control of spending, and high inequality of opportunity and resources based on social class. Their demands are transformative—not only for universal, free, high-quality public education (which they had under Allende), but also tax reform, renationalization of the copper industry to provide the necessary resources, and a refounding of the Chilean state through a new constitutional assembly. This is necessary, they argue, because the 1980 Pinochet constitution—imposed after a fraudulent referendum and perpetuated by successive democratic governments after 1990—enshrines private sector control of the economy and severely limits state intervention. It also creates an anti-democratic electoral and legislative system, requiring a congressional “supermajority” to amend key laws. The students will not endorse a presidential candidate in the upcoming election. However, several prominent ex-student leaders running for Congress (on the Communist Party and other left or independent tickets) have endorsed Bachelet, who has partially adopted their demands for educational, tax, and constitutional reform. The Communist Party has, for the first time since the return of democracy, joined the formal center-left political coalition. Clearly the student movement is pushing the political agenda to the left. Ex-student leader Karol Cariola supports Bachelet. Credit: Ben AchtenbergStudent leaders are seeking to reclaim their historic alliance with Chilean workers, as evidenced by the call for the September 5 student mobilization. Their recent protests have been supported by copper workers, port workers, and other labor organizations. Student leaders clearly see their present struggle as linked to the past. Their demands evoke Allende’s program, while beginning to articulate a vision of a more democratic and equitable Chilean future. At La Pincoya, a población in the northern mountain foothills of Santiago, we meet with young adults who have been inspired by the student movement to return to their community tradition of creating alternative popular structures. This highly organized community, where the streets are named after Pablo Neruda poems, was the site of a massive land occupation led by leftist parties in the 1960s. It became a bastion of support for the Allende government, which delivered social housing designed by the residents themselves through a community-based planning program. Under Pinochet, the community endured massive repression but remained a focal point of resistance to the dictatorship, while developing collective projects such as ollas comunes (soup kitchens) for community survival. After the return of democracy in 1990, these grassroots efforts largely dissipated along with the general demobilization of popular movements. Today, the community operates a popular alternative pre-university program for youth that have been marginalized by the formal education system (44% of Chilean students between ages 15-29 fail to complete secondary school). The program emphasizes consciousness-raising and critical thinking while preparing students for college preparatory exams. Started in 2011, it now has 25 teachers and more than 100 students. For the past weeks and months, Chileans have been bombarded with information and graphic images of the coup, repression, and resistance, including previously unseen documentary footage, interviews, dramatizations, and debates broadcast by the mainstream media. The avalanche appears to have captured the attention of many, especially among the 60% of Chileans who were born after the coup (as well as others who may have repressed or suppressed their own memories). Recent polls show that only 16% of Chileans think the coup was justified, down from 36% in 2003. We get a glimpse of this one night from our hotel room high on a hill in Valparaíso, where down below in the square a local CP candidate has rigged up an outdoor screen for an impromptu showing of a documentary about the coup. It is broadcast at top volume (in French, with Spanish subtitles). People passing through the square stand riveted for more than an hour, shivering in the cold wind. The words to Victor Jara’s song bounce off the hillside: “Hoy es el tiempo que puede ser mañana!” (“today is the time that could be tomorrow”). For the moment, at least, it seems entirely possible. See Ximena de la Barra, “Chile: A Schizophrenic Country,” NACLA Report on the Americas, Vol. 46, No. 3, Fail 2013. See Peter D’Amato, “Today’s Student Movement and the Popular Unity,” NACLA Report on the Americas, Vol. 46, No. 3, Fail 2013.